Photograph, Portrait of young Kezia Payne DePelchin. Courtesy of Find a Grave. Image available on the Internet and included in accordance with Title 17 U.S.C. Section 107. Logo for the DePelchin Children's Center. Image available on the Internet and included in accordance with Title 17 U.S.C. Section 107. Photograph, Portrait of Kezia Payne DePelchin. Courtesy of Find a Grave. Image available on the Internet and included in accordance with Title 17 U.S.C. Section 107. DEPELCHIN, KEZIA PAYNE (1828–1893). Kezia Payne DePelchin, social worker, teacher, and nurse, was born in the Madeira Islands on July 23, 1828, the daughter of Abraham and Catherine Armstrong (Cartwright) Payne. She spent her early life in England. Sometime during the mid-1830s her mother died in her native Funchal, Madeira. The family went to New York in late 1836 and to Galveston, Texas, in 1837. In 1839 her father married their governess, Hannah Bainton. A yellow fever outbreak at Galveston left Kezia an orphan without financial resources; in 1839 she had contracted yellow fever as well but survived it. According to various sources, she arrived in Houston in 1841 accompanied by her widowed stepmother. Apparently Kezia raised a girl, Hannah Cordelia Buckner, for a time, in order to assist the child's widower father. In the 1840s she worked as a music teacher and also practiced charity work among the sick and destitute. With an acquired immunity to yellow fever, she nursed the sick in yellow fever epidemics in Houston. She operated a number of schools during the 1850s, including one in Bastrop (1850). She was married on August 23, 1862, to itinerant musician Adolph DePelchin. They had no children and soon parted company because of his financial recklessness. During the Civil War she joined a nursing corps in Houston. In 1875 she was employed by a German-English school, and in 1877, when the city's free public schools opened, she taught in the Fourth Ward, Houston. She nursed yellow fever victims in epidemics as far away as Memphis, Tennessee, and Senatobia, Mississippi. She was employed for a time at doctors Stuart and Boyle's sanitarium as a nurse. She was appointed head nurse of Houston's first City Charity Hospital, and in 1888 became the first woman matron of the Bayland Orphans' Home for Boys. In 1892, to help her meet the cost of renting two rooms over a store and hiring a woman to care for two homeless children, DePelchin founded Houston's first day-care center, charging only employed mothers who could pay ten cents a day. Kezia Payne DePelchin died on January 13, 1893, and was buried at public expense. Subsequently her work with the day nursery was carried on by her niece, Martha Payne. Photograph, Picture of the original DePelchin Faith Home building. Courtesy of Houston Past. Image available on the Internet and included in accordance with Title 17 U.S.C. Section 107. Photograph, Gravesite of Kezia Payne DePelchin. Courtesy of Find a Grave. Image available on the Internet and included in accordance with Title 17 U.S.C. Section 107. Photograph, Texas Historical Commission marker for the DePelchin Faith Home. Image available on the Internet and included in accordance with Title 17 U.S.C. Section 107. The DePelchin Faith Home, a nonsectarian, community-supported institution for dependent children, was organized on January 20, 1893, by 100 Houston women to honor DePelchin after her death. The home was named in recognition of DePelchin's faith and her belief in the beneficence of the people of Houston. James A. Baker, founder of the law firm of Baker and Botts, drew up a charter and bylaws. 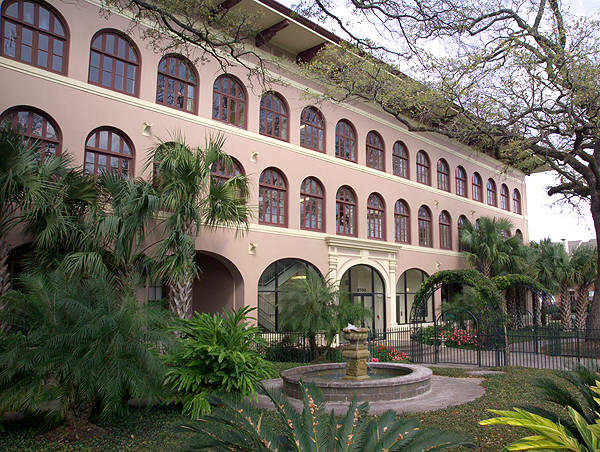 The main building, modeled on an Italianate villa, was designed in 1912 by the architectural firm of Mauran and Russell of St. Louis, and was built on land donated in 1910 by Harriet Levy, wife of a Houston merchant. This building, which served as the home's headquarters for the next twenty-five years, was later added to the National Register of Historic Places (1984) and designated a Texas Historic Landmark (1984) and City of Houston Landmark (1999). Harris County funding for the facility was first obtained in 1914. A twelve-acre site that now serves as the main campus was purchased in 1927, and the institution was renamed the DePelchin Faith Home and Children's Bureau Association after it obtained a new charter in 1928. In 1934 a fifty-acre farm near Spring, Texas, was acquired for use as a summer camp and group home, and in 1936 the institution absorbed the foster-home program of the Houston branch of the Florence Crittenton Homes Association and became involved in adoption and protection work. Nine new buildings were completed in 1937 with the help of the Works Progress Administration (see WORK PROJECTS ADMINISTRATION), as well as state and local funding. The DePelchin Home is considered the first Houston institution of its kind to serve black children (beginning in 1939). It was one of several founders of the city's Community Chest (now known as United Way). In 1940 it provided services for a total of 1,087 children. By the 1950s, the institution included a hospital, a clinic, and a library, and was a member of the Child Welfare League of America and the Houston Council of Social Agencies. In 1983 the home was renamed the DePelchin Children's Center to reflect its expanding role as a multi-service agency. In 1978 the Cullen Bayou Place mental health program began, and during the 1980s the center opened satellite offices in multiple locations in the Greater Houston area. A new forty-bed psychiatric hospital began operation in 1991, and in 1992 the center merged with the Houston Child Guidance Center, a local provider of mental health services for children and adolescents. In 2012 the DePelchin Children's Center became the fifty-second member institution of the Texas Medical Center. That same year, DePelchin affiliated with the Caring Family Network, an Austin-based foster care and adoption agency. In 2016 the two organizations merged under the DePelchin name to form one of the largest private foster care and adoption agencies in Texas, with offices located throughout the state. At that time the DePelchin Children's Center also offered programs in psychiatric care, family counseling, prevention and early intervention services for at-risk youth, residential treatment, special education, home therapy, parent education, child-abuse prevention, and autism assessment to nearly 30,000 Texas children and their families. Mrs. Henry Fall, ed., and Mabel F. Smith, illust., The Key to the City of Houston (Houston: Federation of Women's Clubs, 1908). Harold Jackson Matthews, Candle by Night (Boston: B. Humphries, 1942). Marie Phelps McAshan, A Houston Legacy: On the Corner of Main and Texas (Houston: Gulf, 1985). David G. McComb, Houston: The Bayou City (Austin: University of Texas Press, 1969; rev. ed., Houston: A History, 1981). WPA Writers Program, Houston (Houston: Anson Jones, 1942). Handbook of Texas Online, Diana J. Kleiner, "DEPELCHIN, KEZIA PAYNE," accessed April 18, 2019, http://www.tshaonline.org/handbook/online/articles/fdekt. Uploaded on June 12, 2010. Modified on February 21, 2017. Published by the Texas State Historical Association.